rm.Compliance is a service-supported insurance compliance program designed to centralize the administration and automate the request, follow-up, processing, auditing, and annual tracking of third party Certificates of Insurance, Endorsements, Contracts, and other related supporting documents. 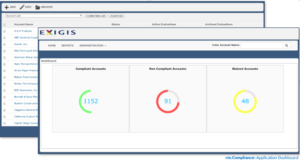 With rm.Compliance, you have vendor insurance compliance software that ensures risk managers have a unified dashboard to easily monitor activity, progress, and real-time insurance compliance activities across the organization. Automates the application of ‘standard’ contract requirements according to predefined – contract type, region, value, total spend, products/services etc. Centralizes the intake and processing of compliance data and documents across operations – Vendor Account data, Insurance Certificates, Endorsements, Policies, etc. One to many architecture enables the management of multiple third party agreements in a single Account Record – leverage common data across multiple Vendor agreements, piggyback on existing (already collected and verified) Insurance Certificates, monitor total spend across agreements, track combined exposures, etc. 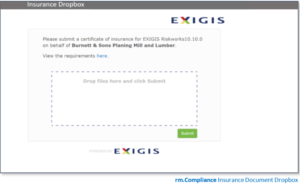 Integrated data extraction tool automatically extracts relevant insurance data from submitted third party documents and performs first-level compliance evaluation and ‘scoring’ – second-level audit and final evaluation is performed by Exigis Services Representative. Verify and track supporting documents – Contracts, Purchase Orders, Indemnification/Hold Harmless Agreements, Form W-9s, Performance Bonds, etc. Configurable web interface to exchange data with complementary procurement, contact, or tenant management systems – Oracle, MRI, SAP, Ariba, JD Edwards, PeopleSoft, etc.